(MoneyWatch) Apple (AAPL) squeaked out sales and profits that were ahead of reduced analyst expectations. The company announced that it is boosting its dividend by 15 percent and buying back $60 billion in stock. All that cheered investors who pushed up Apple shares over 5 percent in after hours trading. But not all is well. Gross margins continue to drop and the company will have to hit the top end of its guidance for the third quarter to even see flat year-over-year sales then. Apple's revenue for the quarter was $43.6 Billion, with earnings per share of $10.09. That compares to average analyst expectations of $42.59 billion in revenue and $10.07 in earnings per share. In the same quarter last year, revenue was $39.19 billion, with $12.30 earnings per share. However, gross margins were 37.5 percent, compared to 47.4 percent year-over-year and 38.6 percent the previous quarter. Even with the sales growth, earnings could not keep pace. In the previous quarter, Apple failed to meet revenue expectations. The quarter before, Apple missed analyst profit projections. The problem is that Apple has not been able to sustain its high margin levels. The company actually sold 37.4 million iPhones in the quarter, compared to 35.1 million the year before. 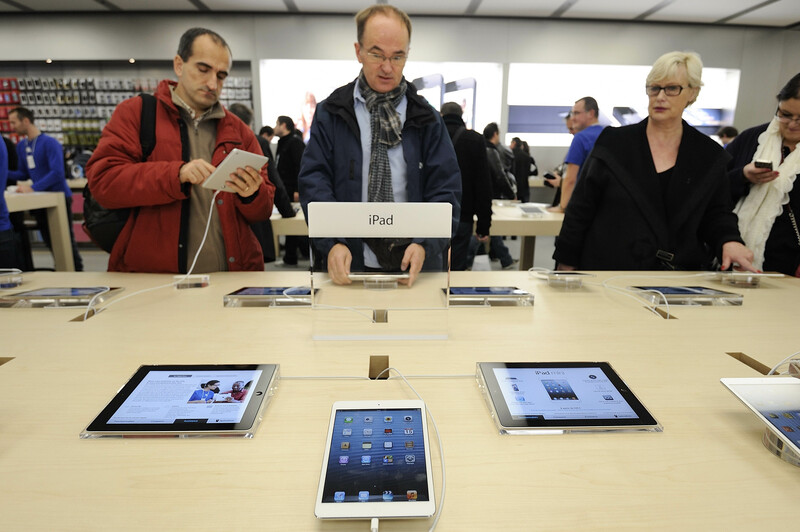 And the number of iPads sold was 19.5 million; the same period last year saw 11.8 million. Mac unit sales were flat. There have been a number of recent reports suggesting that product sales were down. In addition, Verizon (VZ) iPhone activations were down 33 percent compared to the previous quarter, which included holiday sales. Last year, the drop between quarters was 24 percent. Furthermore, only half of the iPhones sold were the latest model 5. It suggests that people are either becoming more price conscious or haven't seen enough reason to upgrade, particularly when other vendors, like Samsung, have heavily competitive products. Consumers moving to less expensive offerings undercut the company's business and prevented more profit and revenue growth even with a higher number of product units sold. Apple needs an infusion of sales -- a big new hit -- if it is to again command a premium price over rivals. But given that the company is offering guidance for next quarter of gross margin between 36 percent and 37 percent, such a hit will likely be in the distance.